Do your children like boogers? Mine do. They even like the word “booger.” If you ever see my children and want to make them laugh, just say “booger.” It’s a sure thing. 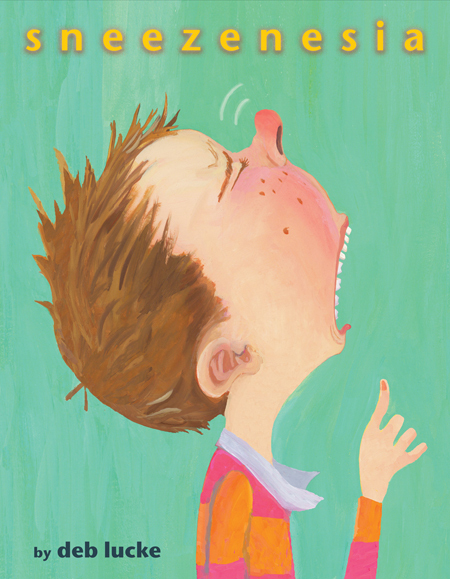 So imagine my utter joy at finding Deb Lucke’s quirky and wonderful “Sneezenesia” in which a little boy at the supermarket sneezes so hard he forgets his name. And with each sneeze, he loses a little bit more knowledge. Math equations…names of Presidents…they all come out of his schnozzola with each “achoo.” I don’t think I could have scripted a more wonderful book for my sons – knowledge as boogers. Tremendous. But how will he get the knowledge back? Sniff around and you may find out.